A drum kit, drum set, or trap kit is one of the most difficult instruments to record effectively. There are many different percussive elements that all work together to create a drum kit. This includes drums hit with sticks (toms), a drum hit with a beater kick pedal (kick or bass drum), a drum with strands of metal stretch across the bottom (snare), cymbals hooked together to create a choked sound (hi hat), and cymbals to both hit and let ring and to keep time. It would be much simpler if you only had to record one of these at a time, but all together? That creates a world of challenges. These challenges can simply be overcome by understanding the elements of a drum kit, learning how to tune drums, becoming familiar with some standard mics and placements, and dealing with bleed and phase issues. • Kick Drum (Bass Drum) – Low frequency drum that is set on it’s side and played with a mallet beater rigged to a foot pedal. • Snare Drum – Mid to high frequency two headed drum played with a drumstick and rigged with a taught set of snares (metal, plastic, or nylon strands) strung across the bottom head that provides the ‘crack’ of the drum set. • Toms (Tom Toms) – High to mid to low frequency two headed drums played with a drumstick providing an almost pitched drum to use in fills and other rhythm figures with a drum set. • Cymbal(s) – Flat piece of metal (actually made from flattening a wind of wire) that is hit with a drumstick or mallet providing an explosive metallic sound used for either a sharp accent (crash, splash, or china) or as a division of the beat (ride). Even though everything looks modern, drums are still based on a simple design that has been used in hundreds of cultures for thousands of years. Take a cylinder and stretch a skin or material over one open side and then hit it. Modern drums work the same way. They are cylinders with a drum ‘head’ attached on one or both ends, that is tightened with metallic hardware. The tighter the head, the higher the tuning. Now drums can’t necessarily be tuned to a specific frequency, because their harmonic structure is so full that the sound is basically a burst of noise. But they can be tuned to an ideal resonance with the size of the drum, and they can also be tuned to sound higher and tighter or lower and looser. The level of tightness or looseness is not really the concern, it’s the consistency. 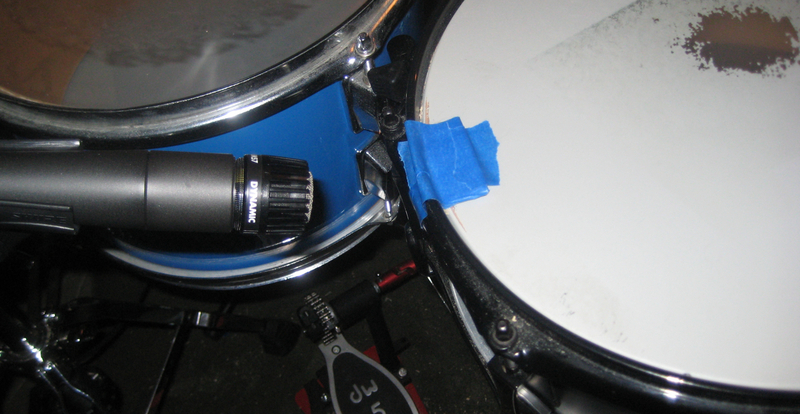 Drum head tightening hardware on modern drumkits have a series of lugs, screws, or tightening points around the drum. These are used to tighten the head to a similar level of tautness on all edges. If the edges of the drum are not equally taught, the drum sounds less focused or ‘out of tune’. Tuning drums is both about making the head equally taut and finding a level of tautness that is desirable for a specific drum sound. Check out the video below to learn how to tune drums.